Apparently an email address I own is similar enough to an Indian surname that I get a fair amount of misdirected business correspondence. Despite protestations that they have the wrong address, one large financial institution however continues to send me account updates (including account numbers, balances and addresses). The documents are sent as password protected PDFs, which might be fine, except that they state in the text of the email that the password is the user’s date of birth in the format DDMMYYYY. Those of you passingly familiar with the concept of entropy no doubt let out a groan there. For the rest, here’s why: using a date of birth reduces the complexity of the password into the realm of “trivially weak”. Entropy is a common measurement of information complexity; how “surprising” a piece of information is, or how “unknown” it is (…stick with me on this). Simply knowing that the password is a date reduces the unknown-ness of that password from a reasonably-secure level to an entirely unacceptable level. For comparison, if we assume an 8-character password with the 94 standard keyboard symbols, we have an entropy of (8 log2(94) ) = 52.44 bits (or equivalently, just over 6 quadrillion possibilities), which is reasonable for most purposes. On the other hand, a date isn’t just an 8 character password. It’s not even an 8 character numeric password (with obviously 99,999,999 options, or 26.8 bits of entropy), which would be weak but not laughable. In fact, it’s really a 3 character password: a month, a day, and a year. Those are respectively ~30.44 possibilities (days per month), 12 possibilities, and 60 possibilities (assuming our account holder was born between 1940 and 2000). In bits, that’s approximate 4.93 + 3.58 + 5.91 = 14.42 bits. An analogous password described in characters we are familiar with would be a three character password made up of: a single number, followed by a single lower-case letter, followed by a single alphanumeric. So, your password options are no different (entropy-wise) than “1aA” or “8q3”, and you didn’t even get to pick your wussy three characters. Now datelist has a properly formatted date for each day in our range. How many possibilities is that? That’s in line with our estimate above. Cool, let’s use that list to break a PDF created with this password scheme. Pdfcrack is a simple open-source password bruteforcing tool that helpfully takes a wordlist. One fifth of a second. Super secure! So, to wrap up. Less complex passwords are reasonable in a security context where a system can monitor password guessing: web based systems, network logins, etc. Then you can respond with enforced guessing intervals, CAPTCHAs or secondary validation. However, when the attacker can take the data for offline cracking, the required strength of passwords goes way up. Using and trusting weak passwords in this instance caused this company to broadcast sensitive information that it wouldn’t intentionally expose. The company would be much better off providing users a random 10 character code that they can write down and use to decrypt the account statements (yes, seriously, write down your passwords), or simply asking users to log in for the statement information. I’ve gotten reports from a few people about an SMS phishing scam that is targeting customers of a small credit union near Sacramento, CA. Ordinarily I’d just ignore it as one more bit of flotsam in the teeming sea of junk that’s on the net, but this one has a few interesting aspects. NOTICE: Your YOLO-FCU CARD starting with 4661* has been put on hold. Please call us at (888) 819 9661. 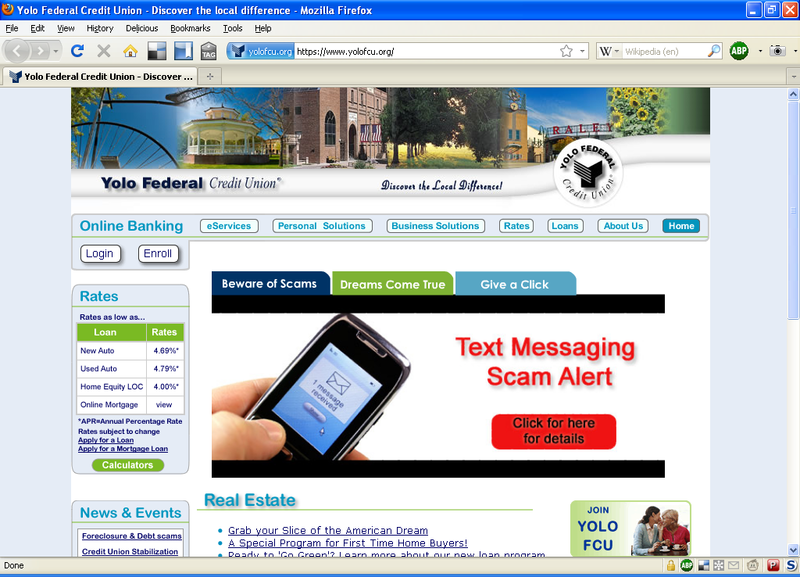 Thank you for calling Yolo Federal Credit Union 24 hours (sic) credit activation services. For card card activation, press 1. To change your pin, press 2. To end this call, press pound. The usual first line defense of simply reading the text (and listening) in this case should be a least a mild tipoff. The first detail that jumps out is the use of the first four digits of the account number (“starting with 4661”). Banks and card issues always refer to accounts by the last four digits, because the first four are always the same for a given issuer; they’re called the Issuer Identification Number (IIN). What’s particularly devious about this detail is that it lends false credibility to the phish because it invites users (victims) to improperly generalize from the familiar security practice of referring to an account by only the last four digits. The next detail that seems a bit incongruous is the synthesized voice message. While not entirely unknown, one might expect a reputable credit union to use a real voice in the recorded message (if only for customer service reasons). Other than those couple details (and the fact that no bank should ask for the information it’s requesting), this is a pretty decent phish. I give it a C+. Using SMS is a new twist, and is devious for the same reason the IIN was. The use of the cell phone as out of band (OOB) authentication (for email, banking and brokerage accounts) is beginning to permeate the public consciousness. Likewise, SMS doesn’t (in the US) typically get spam or solicitors the way email and land lines do, so it has a bit more of an aura of authenticity. These two pieces help make this particular incident nastier than your average phish. We all need to remember that the more something feels secure, the more value there is to the criminal in subverting it or co-opting it. User training and UI design can’t just be about making users feel secure, it has to be about making them feel secure when they are actually secure, and likewise (and just as important) making them feel insecure when they are actually insecure. If you regularly teach your users to “look for the lock icon” when connecting to a secure site, it can’t just be rote (though I know sometimes that’s what we have to settle for). What we should also teach along with it are the implications of what it means when the lock isn’t there. This is the type of knowledge that can help internalize and instinctualize security behavior (yes, I made up a word). 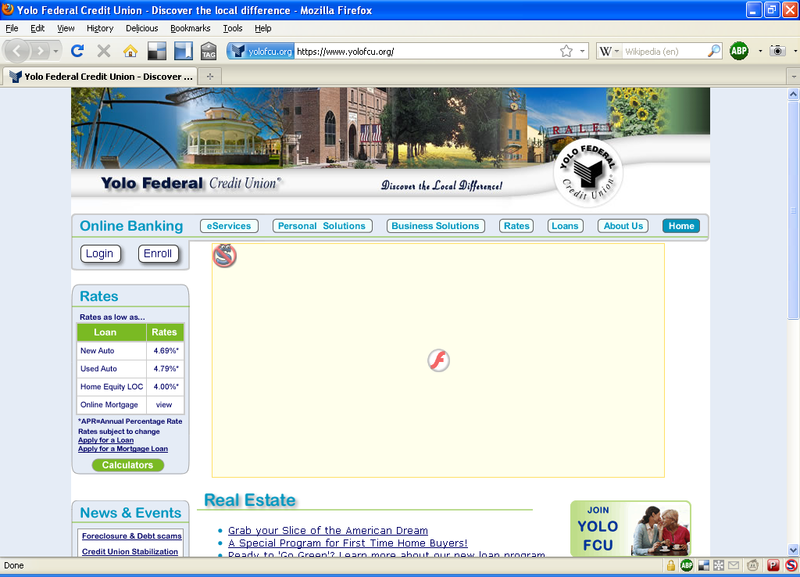 The last thing that I thought was interesting was the website for the real Yolo Federal Credit Union. Here’s a catch 22 for YFCU; I’m sure they would advocate secure browsing practices (using NoScript while doing online banking is a no-brainer), and yet users trying to do that right wouldn’t see this important security information on the site. You’ll notice that it’s all an image, and wrapped inside a flash object. So, again a plea to site designers banks and everyone else; please, at least meet your security conscious users half way. Similarly, the first five digits of a Social Security Number (e.g. 224-87-XXXX) are also fairly public information. Data that is presumed private has the effect of legitimizing a communication, making it all the more important to help users differentiate public and private data. The first portrayal of hacking that gets it right; I officially owe this man a case of beer.